I was looking for solutions that might help ease my ear infection pain a bit, because everything is so plugged up that I think my entire building can hear my TV. And then I saw this. Ew, no, no, no no, no. For everyone who doesn't want to click through, this Earth mama decided to soothe her child's earaches with pee. His pee. 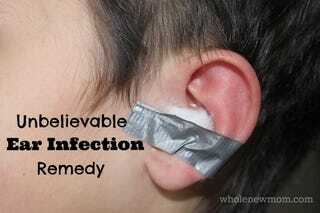 That's his ear with pee in it, and since the cotton ball wouldn't stay, she duct taped it on. What the hell? What are the strangest home remedies you've ever heard? Have you ever tried them? Please don't put pee in your ear. Though I will say that watching Fresh Off The Boat did remind me that I need to buy some White Flower Oil, I will stand by my belief that the stink of it alone will scare off any virus.